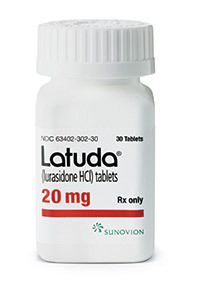 Sunovion announced that Latuda (lurasidone HCl) is now available in 20mg dosage strength tablets. Latuda is a once daily atypical antipsychotic agent indicated for treatment of patients with schizophrenia. Efficacy was established in four six-week controlled studies of adult patients with schizophrenia. Latuda is a mixed dopamine D2 and serotonin 5HT2A receptor antagonist. It was first approved by the FDA in October 2010. Latuda is already available in 40mg and 80mg dosage strengths in 30- and 90- count bottles. For more information call (888) 394-7377 or visit www.latuda.com.